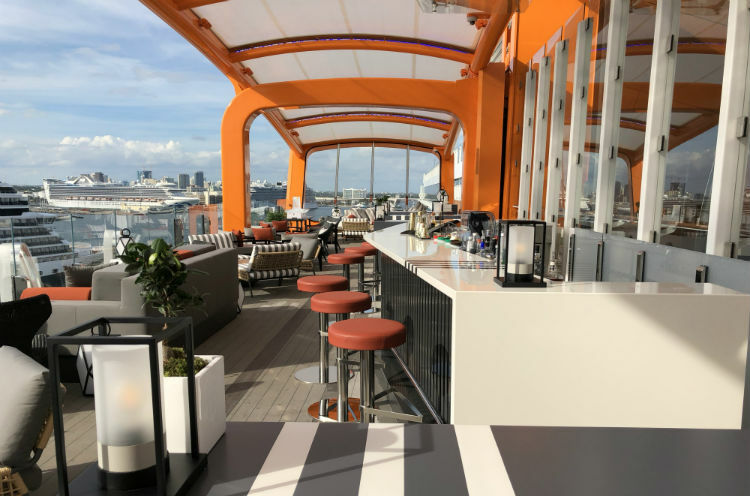 The new Celebrity Edge is without doubt the most talked-about ship of 2018 in cruising circles, and for good reason. 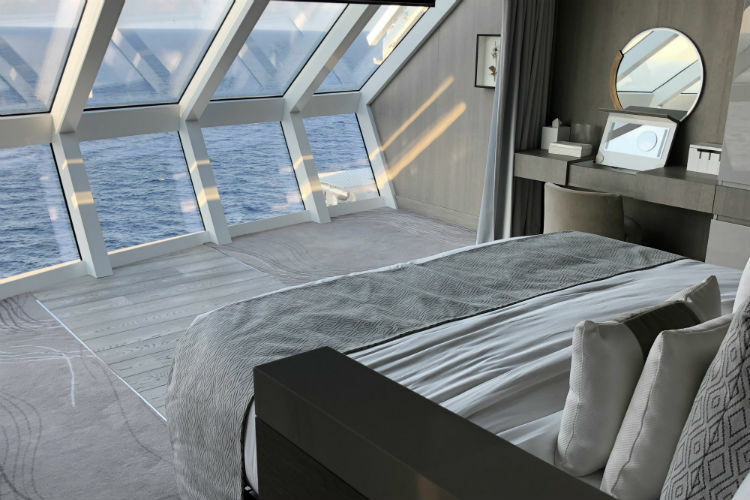 As well as being packed with high-tech features that have never been seen before at sea, Edge is exceptionally beautiful, epitomising Celebrity’s quest to embody ‘modern luxury’. Edge is a big ship, with a capacity of 2,918, but a surprisingly serene ship, as well. There’s a real sense of connection to the sea, with vast expanses of glass allowing uninterrupted views, and high ceilings providing a sense of space. 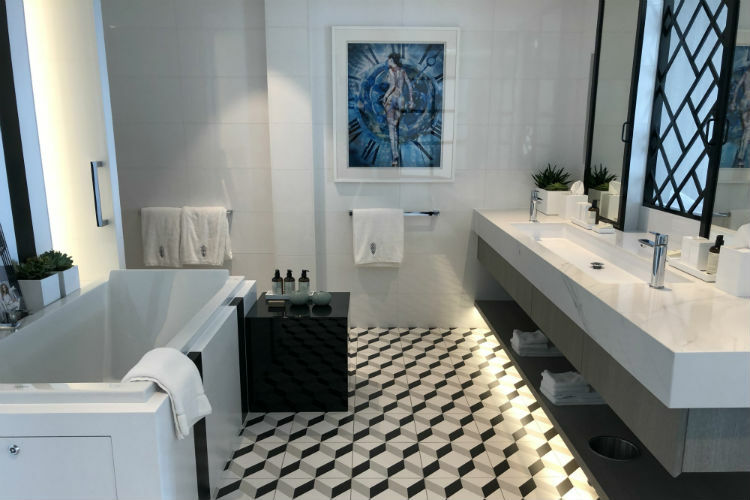 The cabins, suites and spas were designed by Kelly Hoppen, of Dragon’s Den fame, and are beautiful; everything is curvy, or textured, inviting you to touch. Colours are all soothing neutrals: cream, taupe, soft grey and oatmeal, with bright splashes burnt orange or emerald green. 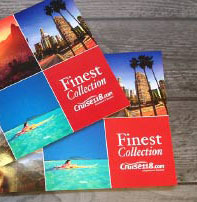 Celebrity Cruises is clearly after the luxury customer with Edge. Some 12% of the accommodation is suites – more than twice that on the line’s other ships. All Suite Class guests have access to The Retreat, a ship-within-a-ship haven of a light and airy lounge, the Luminae fine dining restaurant and a stunning private deck furnished with pale grey and white loungers. Three basket nest chairs are suspended invitingly over the pool. There’s a wide choice of suites but two of the most exciting are the new ones. Six duplex Edge Villas, which open straight onto The Retreat’s deck, have whole walls of glass facing the sea and a private plunge pool on the balcony. The two Iconic Villas, which sit on top of the bridge wings, are even more lavish, with outdoor Jacuzzis, canopied day beds and cocoon-like loungers on a vast private deck with uninterrupted views. There’s plenty more to explore. The spa is a peaceful oasis with all sorts of unusual features, not least massage beds made of healing crystals and an infrared sauna facing out to sea. In the state-of-the-art gym, Peloton bikes live stream spinning classes from the Peloton studio in New York, while classes include hot yoga, Bungee Fit and HITT (a form of high intensity training). You can’t help but notice the Magic Carpet, an al fresco chill-out lounge on a tangerine-coloured platform cantilevered over the water on the starboard side of the ship. The size of a tennis court, the Magic Carpet moves up and down, with different functions depending on where it sits. On deck two, it creates a spacious tender embarkation area, or an outdoor lounge right next to the sea. On deck five, it’s a dining extension of the Raw on 5 seafood restaurant. On deck 14, it sits alongside the pool deck as a bar, while twice a week, it becomes a restaurant, positioned high up on deck 16. The sea-facing side is pure glass, so you really have a sense of nothing between you and the ocean, and the deck furniture is, of course, infinitely stylish, with big, squashy sofas in grey, white and orange. There are other innovative places to soak up the sun. 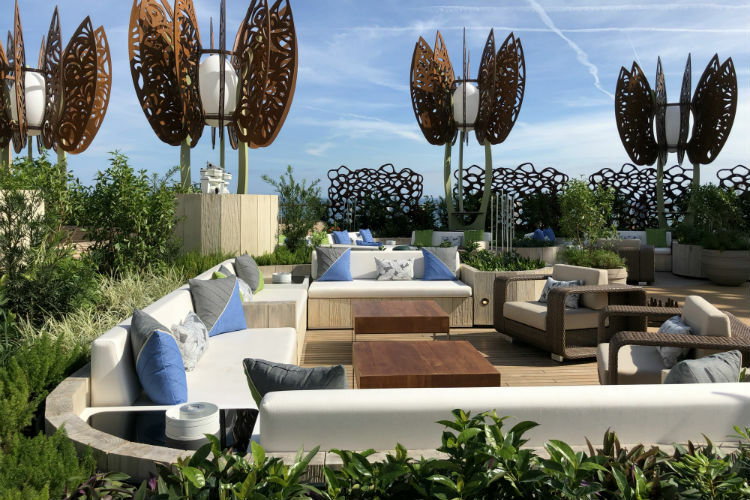 The Rooftop Garden is an arrangement of quiet little enclaves divided up by ranks of lush shrubbery and long, wavy wooden benches dotted with bright cushions. Sculptural wooden ‘trees’ create shade and a live guitar player adds to the laid back vibe. 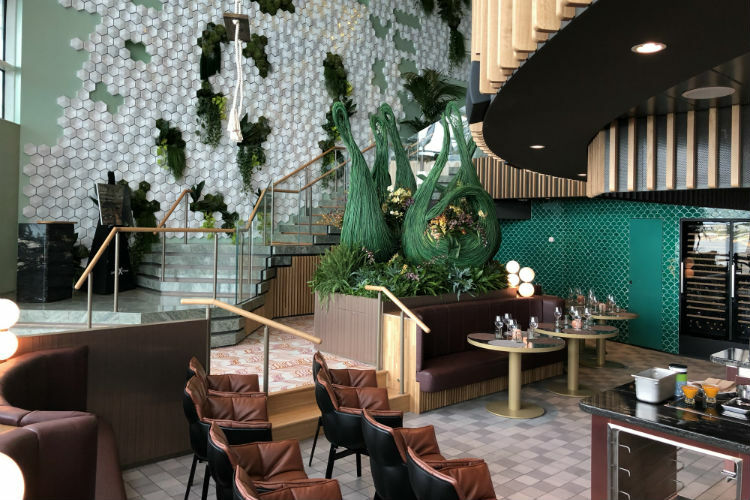 This connection with nature is even more apparent in Eden, a dreamy lounge spanning three decks, supported by skinny, tree-like columns, adorned with tropical plants and surrounded by the tallest wall of glass at sea, almost merging the indoors with the ocean. A walkway spirals around the whole complex space, providing views of the activity below, of which there’s plenty. During the day, you might find a meditation class here, or a mixology session at the bar. By night, there’s a steamier performance by the ‘Edenists’, ethereal creatures in exotic costumes who waft around, striking poses and occasionally performing aerial stunts from a swing suspended high above the restaurant. Eden, with its show kitchen and avant garde cuisine, is just one place to eat. 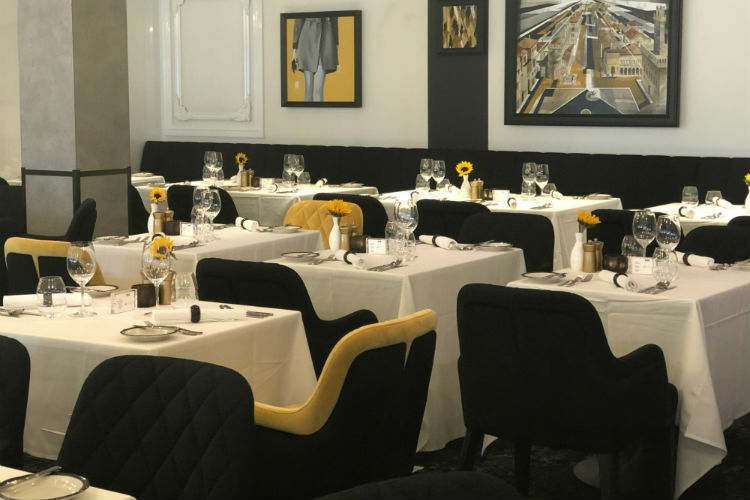 There are four main dining rooms, each with a different theme (Mediterranean, Italian, contemporary American and French) and a couple of places Celebrity regulars will recognise; Blu, for guests in Aquaclass cabins, and Café al Bacio for all-day snacks and gelato. Edge has several new speciality dining options, though. The Fine Cut Steakhouse is an upmarket grill, while Raw on 5 serves great mounds of seafood, including decadent platters piled with lobster, crab claws, chilled prawns and oysters. 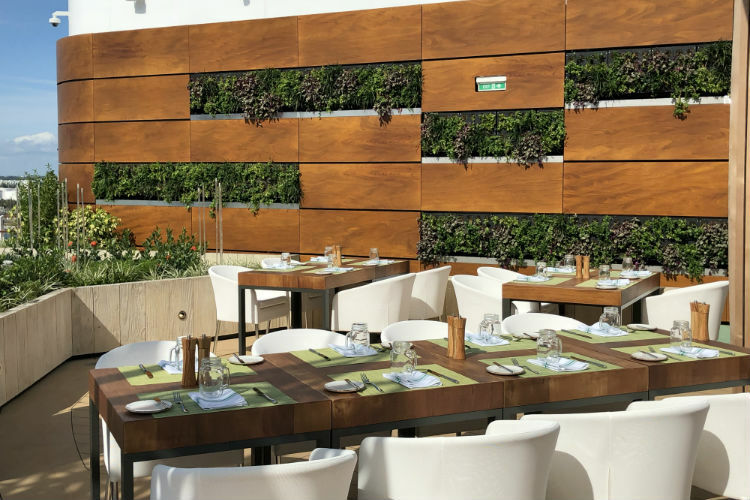 On warm nights, the Rooftop Garden Grill should be a wonderful spot, serving barbecue specials, salads and kebabs. Particularly special is Le Petit Chef in Le Grand Bistro, a French boulangerie and patisserie. At dinner, projectors embedded in the ceiling beam tiny, 3D cartoon figures onto each diner’s plate for an entertaining four-course meal. Four virtual mini-chefs bustle around, preparing food, performing stunts, squabbling and creating four dishes from scratch on your plate. Once the dish is ready, the chefs step back with a flourish and waiters appear bearing an exact, real-life version for you to eat. It’s completely enchanting, whatever your age – and exactly the kind of clever whimsy you’d expect from such an innovative ship. 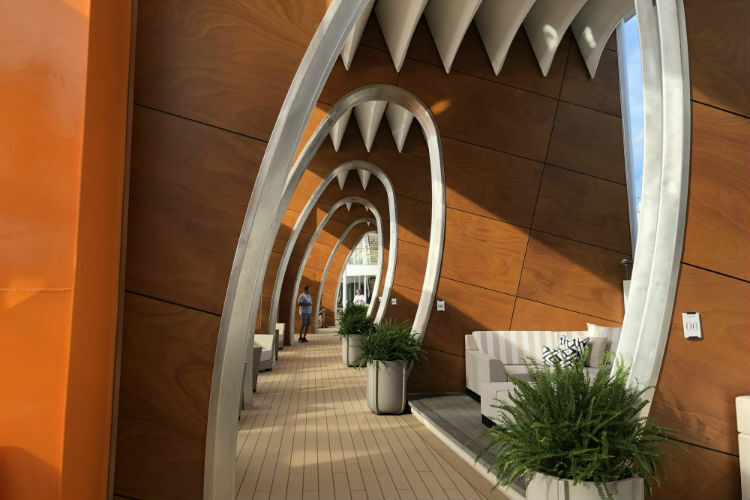 If you would like to know more about this revolutionary cruise ship, take a look at our sailings on-board Celebrity Edge by clicking the button below. All images are authors’s own. Call our Cruise Concierge team on 0808 1234 118 for expert advice and award-winning customer service on Celebrity Cruises and with your booking. I want to cruise with my little dog. Hi Janet, unfortunately Celebrity Cruises don’t allow pets on-board – as lovely as that would be! Thanks, Emma. Hello Joe, Celebrity Edge will be sailing throughout the Caribbean, with her maiden voyage on 9 December. You can see all of her available voyages on our website, here. Celebrity Edge will then move to Europe in April 2019, for a season here. Hope that helps! Emma.